I know one thing for certain: we have all been bored during a film before. It happens. The question is, what do you do with that boredom? Do you fall asleep? Complain about the failings of the film either aloud or internally? Play around on your phone? I ask because over the past few years as I have found myself exploring more and more cinema, I have found myself to be bored beyond comprehension a number of times. I've learned to channel that complete disinterest in the movie into something mildly entertaining, an exercise in taking what I am watching and making light of it in a way that I find humorous. For example, when I sat through the awful mess I, Frankenstein, I came up with a television series concept using the title Yo, Frankenstein, a coming-of-age story portraying the four years of college attended by Frankenstein's monster. With a terrific script and a dedicated showrunner, it could be something special. So now that I have set the table, time to sit down and take a bite of The Boy, the new horror film from director William Brent Bell. It's a painfully boring, completely uninteresting genre piece that feels so stale and silly, my only option was to entertain myself, especially considering I honestly did fall asleep at one point. It was a less than a minute power nap, but it happened. 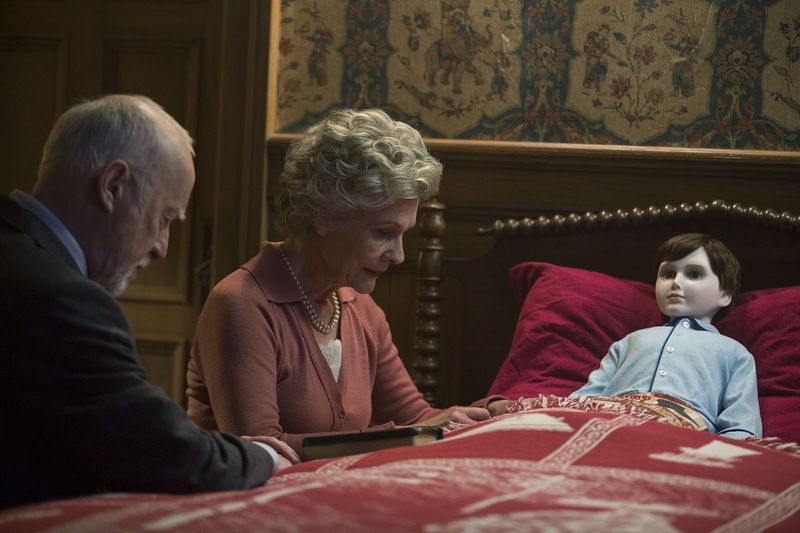 The film tells the story of a nanny being hired to watch a doll named Brahms, a pale little faux boy with a specific set of rules that must be followed in order to keep him happy. I once knew a woman who gave her husband a list of tasks that must be accomplished that day, and she specifically laid out the rules of how he would accomplish them. For a moment The Boy was her origin story. However, the film threw a curve ball during a scene in which the pretty nanny is walking around in her underwear and she notices creepy Brahms staring at her from across the room. Unsurprisingly this makes her feel very uncomfortable, with a look on her face that felt familiar to the one young me saw on a daily basis when I first discovered the beauty of the female form. Perhaps The Boy was my origin story. Perhaps I was Brahms. Dipped a bit into television with Game of Brahms, Brahm's Anatomy and The Big Brahms Theory. Let's get back on track here: the point is, The Boy is a really poor picture. The performances are okay, not great but also not a disaster with Lauren Cohan doing mediocre work in the lead as the nanny. The script is serviceable at its best and terrible at its worst, the direction is without any sort of flash or sizzle to spark any sort of interest and the attempts at being scary or unnerving in any way fall flat, which is a bad sign for a horror film. There is a twist I guess, but whether you care or not will be entirely dependent on your interest level when it happens. As you might have guessed, I didn't. John Kasich hugged that boy, and it felt like this movie. "You know what, Anderson, let me tell ya, I hugged that boy." Those names are gold, pure gold!